While studying seasonal changes in microbial growth kinetics in soils of a subalpine forest in the Colorado Rocky Mountains, I noticed a negative relationship between maximum growth rate and growth efficiency, or yield (the fraction of carbon consumed that is converted into biomass, as opposed to being respired as CO2). Turns out this is a common observation in biology. For the most part, you can’t be good at everything, and so strategies often develop to maximize either growth rate (when resources are plentiful) or growth yield (when resources are scarce). In the case of this ecosystem, the predominant strategies shift with seasons, and this effects the amount of CO2 that soil microbes produce. When we used a simple model to predict soil respiration based on these seasonally-changing microbial growth kinetics, it agreed well with measurements and other models for this ecosystem. The especially inefficient, fast growing community that develops under the snowpack helps explain the large amount of CO2 flux from this ecosystem in late winter. Lipson D.A., Monson R.K., Schmidt S.K., Weintraub M.N. 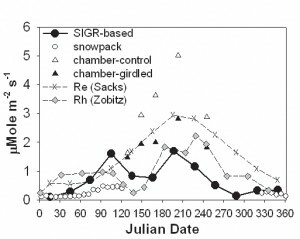 (2009) The trade-off between growth rate and yield in microbial communities and the consequences for under-snow soil respiration in a high elevation coniferous forest. Biogeochemistry 95:23-35, DOI: 10.1007/s10533-008-9252-1. Schmidt S.K., Wilson K.L., Monson R.K., Lipson D.A. 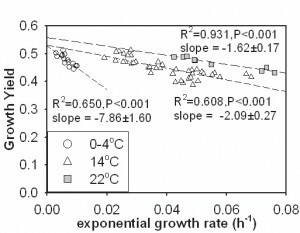 (2009) Exponential growth of “snow molds” at sub-zero temperatures: an explanation for high beneath-snow respiration rates and Q10 values. Biogeochemistry 95:13-21, DOI: 10.1007/s10533-008-9247-y. Monson R.K., Burns S.P., Williams M.W., Delany A.C.,Weintraub M., Lipson D.A. 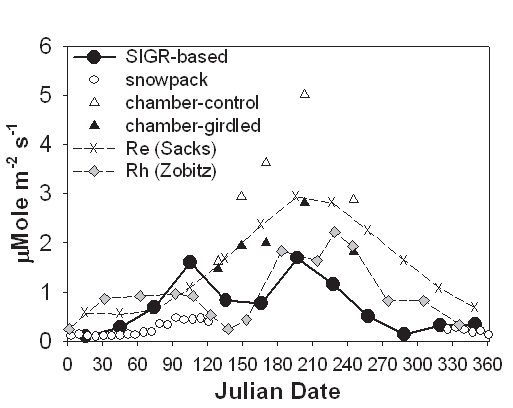 (2006) The contribution of beneath-snow soil respiration to total ecosystem respiration in a high-elevation, subalpine forest. Global Biogeochemical Cycles 20, Art. No. GB3030. Monson R.K., Lipson D.A., Burns S.P., Turnipseed A.A., Delany A., Williams M.W., Schmidt S.K. (2006) High sensitivity to climate in the early-spring carbon cycle of a forest ecosystem. Nature 439:711-714. Beardmore R., Gudelj I., Lipson D.A., Hurst L.D. (2011) Metabolic trade-offs and the maintenance of the fittest and the flattest. Nature 472:342-345. © 2019 Lipson Lab, San Diego State University.